Aunt Sukey's Choice is a traditional quilt block that can be altered in many ways by your choice of fabrics. Take a look at page 3 to see an illustration of four potential layouts before you begin, and keep in mind there are many other ways to arrange color and contrast. Like its layout, Aunt Sukey's Choice can be assembled in multiple ways. We'll use no waste Flying Geese to create the 'pointed' outer midsections of the block -- substitute half square triangle units for the geese if you prefer (cutting alternative at the bottom of the page). Aunt Sukey's Choice can be used in a quilt with an orderly layout, but a block is also a good option if you're making a scrap quilt, with each block sewn from different fabrics. The quilt block finishes at 12" x 12". Pencil in your own color choices. If you are a new quilter, read page 2 for a better understanding of the patchwork units and view the alternative layouts on page 3 before beginning. Not sure about colors? I've included a blank drawing of the block on page 4. Yours may differ, and you could use two each of two fabrics, same dimensions, rather than 3, to sew four patch units similar to the three other block examples on page 3. Take a look at the blocks on page 3. The arrangement in the lower right makes it apparent that two geese units are stacked on top of each other. In other layouts, the geese triangles and backgrounds are made with the same two fabrics, but fabric positions flip-flopped to create a taller (narrow) peak when units are sewn together. Which do you prefer? Decide before cutting fabric. I don't like to say geese when it's really a goose! Half square triangle units are sewn together after completion to look like flying geese on the next page. Make 4 of each type of geese that finish at 2" x 2" (they measure 2-1/2" square after assembly). ​Half square triangle unit instructions. Aunt Sukey's Choice pattern instructions match the quilt block shown on page 1. Make another strip set from the remaining 2-1/2" x 10-1/2" strips. Press seam allowance towards the lighter fabric. Square up and cut (4) 2-1/2" segments. Figure 2. Sew one of each segment together, placing the medium pinks diagonally from each other. Figure 3. Press seam allowance towards the medium pink/light pink segment or fan it out from the center to reduce bulk (a stitch or two will come 'undone' with that technique, bit it makes the units flatter). Make three more four patch units. Use the no waste Flying Geese method to make four flying geese from the 5-1/4" x 5-1/4" black square and the (4) 2-7/8" x 2-7/8" brown squares. The first page of the tutorial is a flying geese introduction -- instructions begin on page 2. Each of the four geese should measure 2-1/2" x 4-1/2" when complete. Figure 4. Use the no waste method again to make four more flying geese from the 5-1/4" x 5-1/4" brown square and (4) 2-7/8" x 2-7/8" black squares. Figure 5. Sew a Figure 4 geese unit to the top of a Figure 5 geese unit. Press seam allowance towards the top (Figure 4) unit. Repeat to make three more flying geese combos that measure 4-1/2" x 4-1/2" square. Figure 6. Refer to Figure 7. 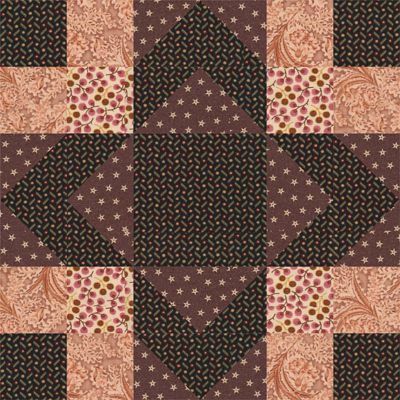 Arrange the patchwork units and the 4-1/2" center square into three rows as shown. Sew components of each row together. Press new seam allowances in adjoining rows in opposite directions and join the rows. Be sure to match seam intersections. Press the quilt block. It should measure 12-1/2" x 12-1/2". Four examples of Aunt Sukey's Choice quilt block color variations illustrate how easy it is to alter the block's appearance. You'll discover many more variations when you experiment with color warmth and contrast. Click on the image to zoom in and pull it up in a new window. Use color (or regular) pencils to experiment with color and contrast for your Aunt Sukey's Choice quilt block.